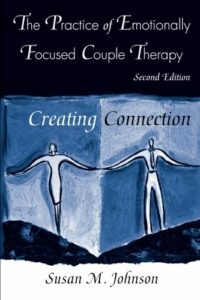 EFT is a structured approach to couples therapy formulated in the 1980’s and has developed alongside the science on adult attachment and bonding to expand our understanding about what is happening in couple relationships and to guide therapists. In the last fifteen years, Dr. Johnson and her colleagues have further developed and refined the model and completed numerous studies. EFT is also used with families and individuals. A substantial body of research outlining the effectiveness of EFT now exists. Research studies find that 70-75% of couples move from distress to recovery and approximately 90% show significant improvements. For more information on EFT research, please see the EFT Research Menu. The major contraindication for EFT is on-going abuse in the relationship. EFT is being used with many different kinds of couples in private practice, university training centres and hospital clinics and many different cultural groups throughout the world. These distressed couples include partners suffering from disorders such as depression, post traumatic stress disorders and chronic illness. For further information about EFT, please click here. New cycles of bonding interactions occur and replace negative cycles such as pursue-withdraw or criticize-defend. These positive cycles then become self-reinforcing and create permanent change. The relationship becomes a safe haven and a healing environment for both partners.